Along with other nearby neighborhoods, volunteers from the Brentwood Darlington Neighborhood Association (BDNA) joined in a "Paint the Town Green Clean-up" campaign on Saturday morning, June 16. Gathering at Woodmere Elementary School, the volunteers – including members of a Multnomah County Community Justice work crew – were treated to a breakfast of fresh bagels, fruit, and beverages, before heading east to S.E. 82nd Avenue of Roses to get to work. 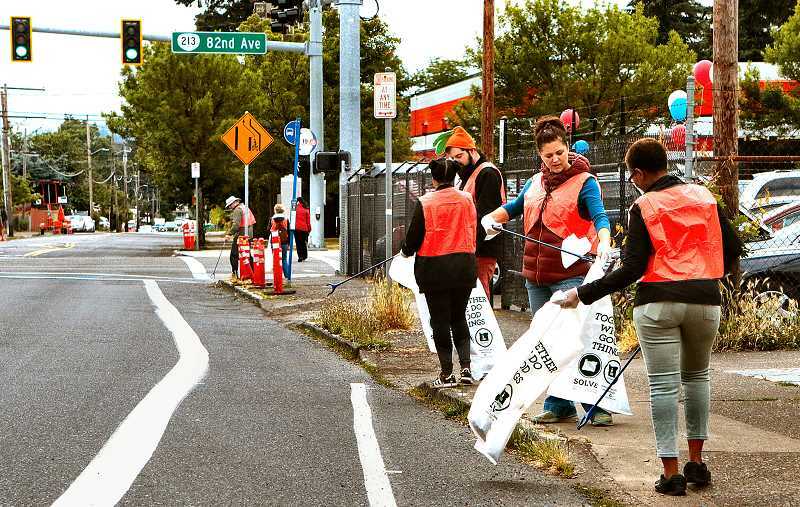 "Specifically, our volunteers are picking up litter, and providing graffiti abatement, along 82nd Avenue, from Duke to Flavel Street," explained BDNA Chair and organizer of the neighborhood's participation in the cleanup, Chelsea Powers. "We are working with the Lents Neighborhood Livability Association, and the Foster-Powell and Mt. Scott-Arleta neighborhood associations, in conjunction with SOLVE – as well as Southeast Uplift, Metro Graffiti Abatement program, and KINK radio, on this project," Powers told THE BEE. The idea was, Powers said, that each neighborhood would take a section of the Avenue of Roses adjoining their respective neighborhoods. With that, the group of about 20 volunteers, armed with trash pickers and graffiti cleaning kits, headed out in teams. "We're all looking forward to joining together for a pizza party at Glenwood Park for lunch after we've cleaned up 82nd Avenue," Powers said before joining them in the work.